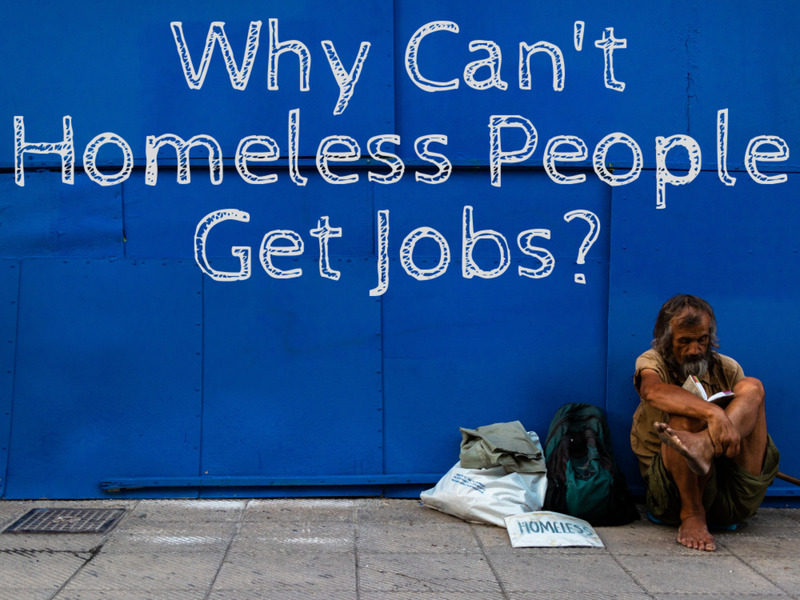 Why Are Homeless People Despised When so Many are so Close to Homelessness? Why Don't People Have More Sympathy? 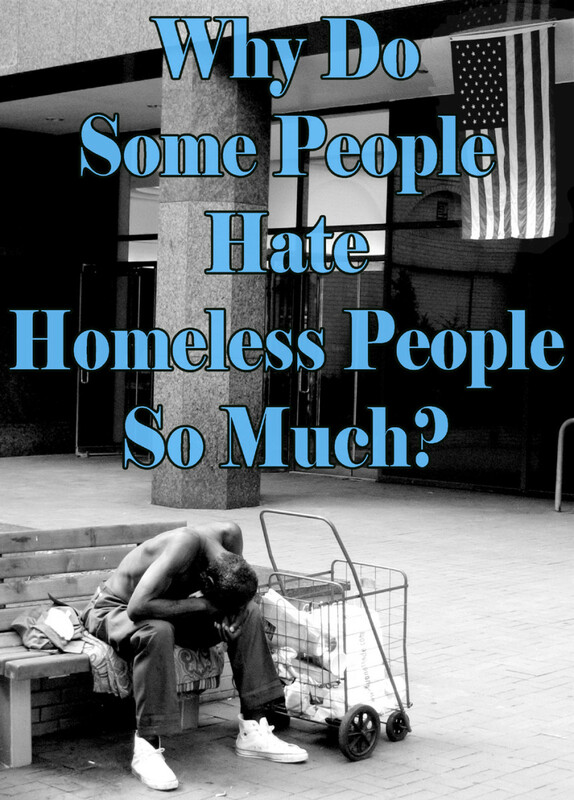 With many Americans but a few paychecks away from homelessness it seems logical that most Americans would have a certain enhanced sympathy toward homeless people. However, it seems quite the opposite. Even as people see those around them, people they were once friends with, lose their homes, the fears and hatred remain and get directed at former friends and relatives. Some people fear and hate those without homes so much that even if they know them, they still despise them. Some even apply those hatreds and fears to their own elderly parents, the very people who once cared for them, when they fall on hard times. They'd sooner believe that someone they knew and loved has become a bad or lazy person than that poverty can happen to good people! Homeless people are despised or disdained, labeled as lazy and worthless. I don't think this is because Americans are insensitive or unable to feel empathy. I have a few theories as to why they are so despised. From comments I have heard and read around the Internet, many people believe that every homeless person is getting a big, fat government check each month. Nothing could be further from the truth. Many don't get anything from the government. Most of those who do receive aid only receive food assistance which is, at most $200 worth per month for an individual and it can only be spent on food. Most shelters are funded by donations, not taxes. The amount of tax dollars that do go to programs directed at homelessness is about $4 billion, mostly directed towards preventing families with children on the verge of homelessness from becoming homeless with little going towards programs to help already homeless people. Already homeless people seldom get aid beyond food assistance. Some elderly people living on the street don't even collect the Social Security income they've paid into all their lives. Many disabled people lose their homes and because the application process for Disability is lengthy and often requires the ability to be contacted by phone and mail and the ability to go to appointments, sometimes a hundred or more miles away they often never collect the Disability they paid into all their working lives. 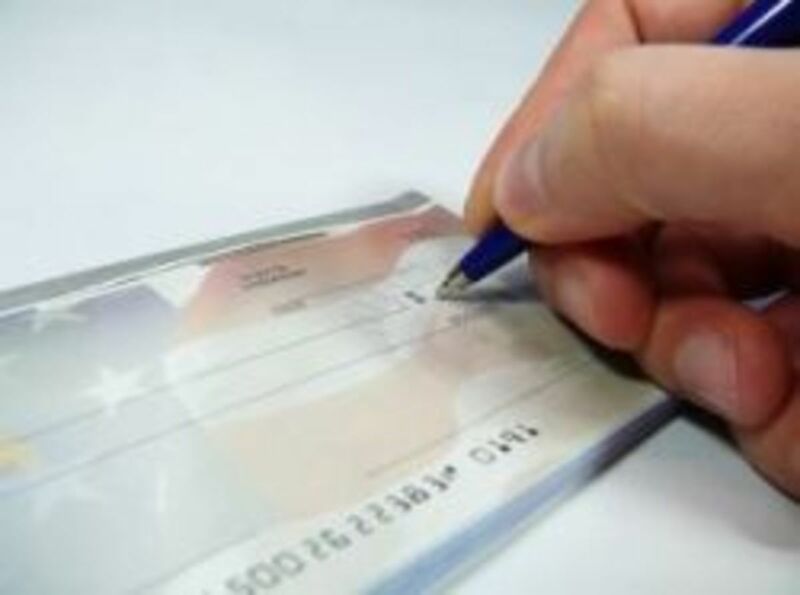 If one is disabled, it generally takes several years to begin collecting that benefit. Most Americans don't have enough money saved up to live on without working for two to five years so many with disabilities become homeless. The majority of mentally ill homeless people are not getting any tax money, either. Most of the folks too mentally ill to hold down a job are too mentally ill to navigate the aid applications. That guy you see picking through the garbage isn't getting thousands of your hard earned tax dollars; he's really living off that garbage. The average American is only one illness or several paychecks from homelessness. If people are beset by woes brought on by the economy and they actually believe that lack of jobs and affordable housing cause homelessness then they'll have to fear it. If people believe that illness, age, or disability cause people to lose their homes then they'll have to fear losing theirs. By sticking to the belief that only people who are bad can find themselves living on the street, they can insulate themselves from any fear of it. In fifteen years of working with homeless people I learned that the majority of newly un-housed folks are shocked speechless that it happens to them. Most of them hang onto their own fear and hatred of homeless people for quite a while, even though they are far more likely to come to harm at the hands of a criminal with a home than at the hands of a homeless person. To feel safe from it themselves, many people with homes feel they must create a quality that defines homeless people. They invent a quality they don't feel they possess so they can feel that as long as they don't possess that quality they can hold it up as a magic shield against their fear of losing their home. For many people, the first thing that comes to mind when they think of people living on the street is panhandling. The only faces of homelessness most average citizens see are those of the ragged folks who beg for change on downtown streets. Only a very small percentage of homeless people beg. For instance, on any given day in downtown Chicago you can find about fifteen to thirty people begging for change on the sidewalks. However, Chicago has somewhere between 6,000 and 12,000 homeless residents, the vast majority of whom never beg. The beggars and panhandlers people have come to see as the face of homelessness make up probably less than one percent of all homeless people. The people who beg are often those with mental illnesses or addiction issues, people who may not even be aware that other choices exist. I think many people are deeply disturbed by panhandlers because it's hard to pretend they don't exist. 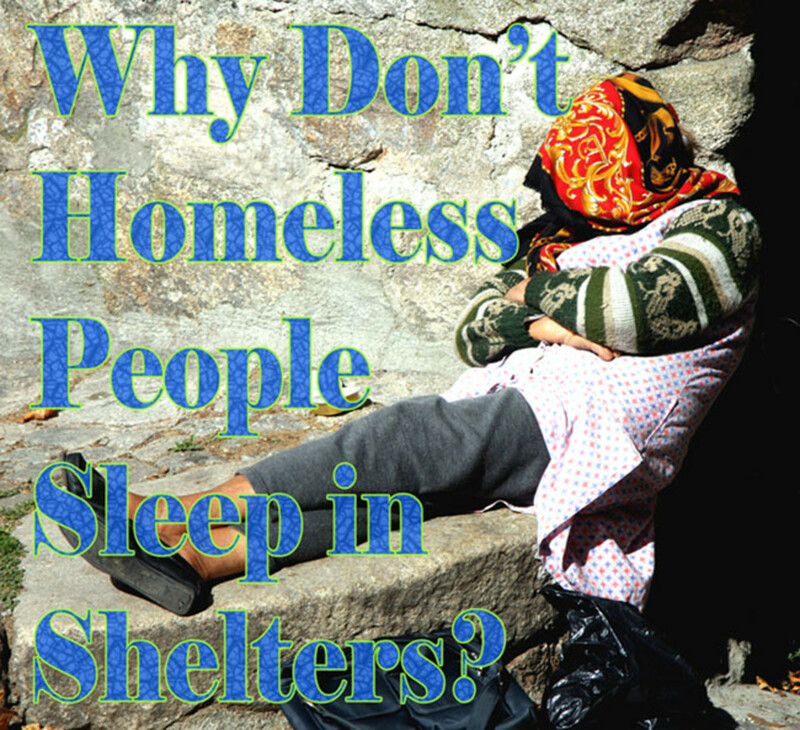 And not only do very few homeless people beg, some panhandlers actually have homes! Not too long ago, I helped an elderly woman re-connect with her family via the Internet. They had so many irrational fears about their own mother that they trusted me, a total stranger, more than the woman who gave them birth. I found that profoundly disturbing. Now that wouldn't be too surprising if she had been an addict or had abused them when they were children but she hadn't. She had actually put her two children through college and just finished paying it off a few years ago. They admitted she had been a very good mom and had always treated them well. The reasoning for not taking her in that her daughter gave me was that she didn't want her to be a bad influence on her children, the woman's grandchildren. We had a bit of a back and forth email interaction, the daughter and I, and I tried to pin down what the fear was. The daughter had made all sorts of assumptions about her mom. Mom hadn't turned into a knife-wielding madwoman addicted to crack, she just couldn't afford her apartment anymore after her hours were cut back and she couldn't find another job. Thankfully, this story had a happy ending and the daughter decided to let her mother come stay with her in her nice home in the suburbs. Comments containing swear words will not be approved. Comments containing racism, threats, or personal attacks will also be deleted. Are you aware that many people that are not homeless beg from homeless people? 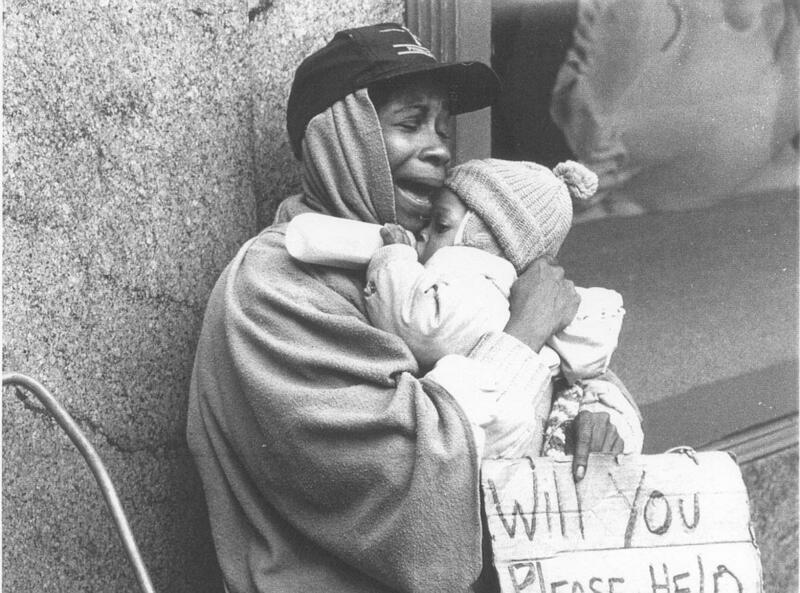 I was homeless in Raleigh NC for many years; I was often asked for money from people who have expensive Subs and even nice homes and apartments. Yes, I was aware, con artists beg from homeless people because I've been homeless, but I doubt many people knew. It's not the fact that they have no home. It's because they are No Good of people themselves. Bad choices bad attitudes bad intentions and they carry hate that they want to take out on the world. Of course we should fear for our safety with them. They are nasty to you it only makes you hate for Homeless people grow stronger. They do it to themselves. I WORK to make my life better than they are!!!!! I hate them with a Passion because they're sort of existence they choose to live is ugly and does harm to society and they dont want to change. All they do is Harass innocent people for just minding their business. I have no sympathy for such pest of human life. You put out hate you get hate in return. Don't judge Me if you haven't walked in my shoes.. If they are Good people but down on their luck then I wish them a Better life and God please Bless those individuals and I will with my ability try to Bless them myself. NO they are not useless they teach lessons you just cant hear them because you don't stop and listen but you had a great article. Your Hub is an excellent examination of the issue. Thanks for being an important voice for the voiceless. I'll be scrolling through and reading your other Hubs. People hate them because they are useless to society. I Gave A Homeless Person A Slice Of Pizza Once The Sight OF Him Made Me Cry Thinking About How Bad Homeless Have It. So you had an experience with a drunk woman in the low income housing you live in and decided to not read the above editorial before commenting? Forming your opinion of hundreds of thousands of Americans based on that one experience would be like me declaring all homed men are savages because I was raped by more than one and hospitalized by more than one when I was homeless and again when I was not. I hold no such opinion because I know people are individual human beings. You don't read other people's words or use logic, so you won't even see this, but what if your three year old needed an organ transplant and the costs left you homeless just like it has many parents of children with serious illnesses? What if your wife got cancer and again, you lost everything? What if you got in an accident and died; would your wife be a loser if she couldn't keep your apartment? How about if you served in the military and lost the use of your legs like a local homeless veteran I know? What if you and your wife both died and your child went into foster care to be dumped from it, homeless, the way many foster children are, the second it's legal? Would that make your child a loser? Living in low income housing as you do (nobody has hallways random drunks can get into in decent housing), you are one serious illness or one neighbor being annoyed with you from homelessness yourself. Is that why you are so scared and hateful? A drunk/drugged out one kicked in my door at 2 in the morning swearing someone lived in our apartment when I didn't even know who they were talking about. Oh yeah, and as a result terrified my wife & 3 year old at the time. Cops arrest her but, tell me right off, she's gonna be let out immediately. Exactly what happened because according to the law around here, oh, she was heavily drunk so she's somehow not responsible for her actions. Yeah, I've had an issue with the homeless ever since. Not to mention our city is overrun with them and no matter what they do, it's not their fault somehow? Today I had a customer go through my line and was mortified to hear her making fun of the man in front of her. (Who happened to be homeless)... He was a paying customer and had done nothing wrong at all. So when she told me quite loudly that he smelled bad, I told her to please not make fun of him because he couldn't help it. She thought I was having an attitude with her and got annoyed that I had responded that way... But there's something in me that just can't allow anyone (no matter what the situation or circumstances) be treated that way. I wasn't being rude, I just felt like it was beastly and cruel of her to make such a big deal that he didn't smell very nice. She wanted me to stop what I was doing and spray something to dissipate the non existent lingering odor. Her cruel comments were heartbreaking. Being a cashier there's very little I can do, but when I'm faced with situations like this all I can do is do my best to respectfully disagree and politely suggest calling the manager. This customer insisted that I was being rude but refused to talk to management and kept threatening to call customer service on me. Simply because I politely and respectfully defended the homeless gentleman who probably already felt out of place in our store and wasn't hurting anything or anyone. I wasn't rude, i just couldn't let her treat anyone that way. It really upsets me. i am reading these comments, and i am very disturbed by how people treat homeless, and view homeless people. I have been homeless for years, and let me tell you, i am not a drug addict, and no i am not a bad person, and i never panhandled. Let me tell you it was like being tortured, and was a nightmare, like living in hell. after going through this experience i am not a nice person anymore, and hate people because of it, it has really damaged my mental health, and really damaged me forever. Also a very cruel way to make someone live. let me tell you, it really teaches you how mean, and evil people are in this world. the reason why there homelessness is because your government designed it to be that way. 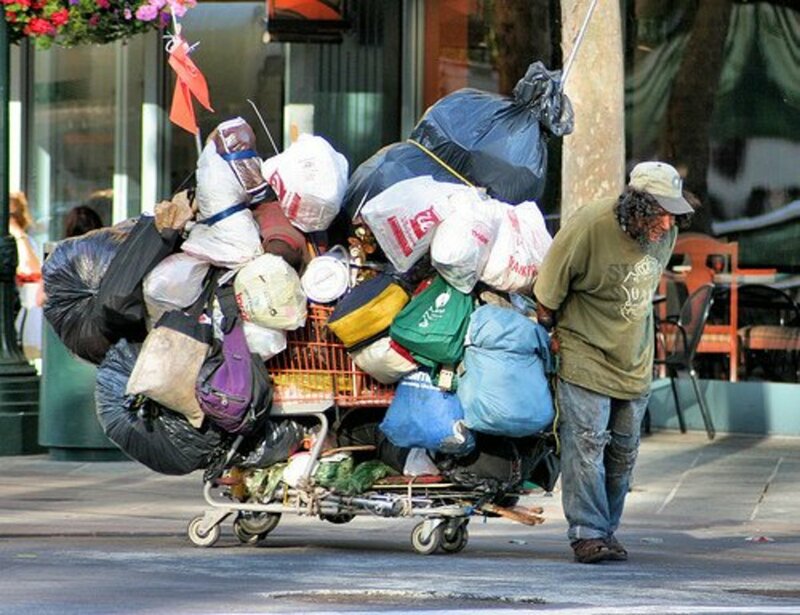 before you say homeless people are annoying and panhandling and stuff like that, ok go ahead wear there shoes be homeless, after awhile you will feel the torchure the torement, youll get sooo desperate, youll never ever ever get a job, It will create more barriers to get housing and work and money. it will ruin your life in so many ways. ohh ontop of that you need an address to have a job, and if you do how long will you hold that down before you get fired because you cant shower or look after urself, and you cant handle your mental health because ur sooo stressed rate out that you cant even funtion anymore. A normal person who goes homeless wount function very long and is useless because of stress and mental health ishues devloped by living homeless, when your homeless your brain fries. you need a proper facility to survive, not a homeless shelter. people who are homeless are in a situation where there gonna die, your always exposed to weather, your always outside, and if someone wants to hurt you they cant find you anytime of the day, ohh ontop of that your always out in the open for people to attack you. also you cant focus on a job because your ishues are soo bad, youll never ever break the cycle of being homeless, being homeless is a full time job in its self, ohh stay at a shelter, nope not an option. shelters are sooo soo bad even when i was homeless in -40 weather i still stayed out on the street and almost frooze to dealth on certain days. The reallity is , is people are selfish and hatefull. i really hate and despise people who hate homeless people. even if i am doing well and what not, if someone makes a rude comment towards someone in need, i will hate that persons gutts for ever and tell them to get away from me, i really do have smypthy for homeless people. people on here making these bad comments about them, go be homeless for a week or a month, and tell me how imposible it is to get a job or support urself. Tell me how hurtfull it is that everyone hates you because ur homeless. tell me how hurtfull it is you have no freinds because you dont have money. Just tell me how bad the hurt will sink in. tell me how hurt your feelings and how much hurt and pain youll carry with you everyday . anyway the people on here making these disgusting comments towards homeless people, satan has your soul, and your worshipping satan when you worship the dollar. Capitalism needs to be tooken out. Don't give to panhandlers. Only a very small percentage of homeless people beg. Those who do are often those with serious mental illnesses so they should be left to the professionals. Also, as said in the page above, not all panhandlers are homeless. I don't see myself as insensitive but do admit that I don't give to panhandlers. The main reason is that I was attacked by a panhandler after I told him that I don't have any change and he didn't believe me and tried to help himself to my wallet. I don't like total strangers walking up to me and begging me especially when a lot of crooks also use this tactic to rob people. For example they will pose as panhandlers asking for change and grab their purse or wallet as they try to give them change. I've also overheard some panhandlers complain that too many people give them food when they prefer change. I give to homeless shelters but it creeps me out when total strangers interrupt me while I'm minding my own business asking for change. Especially the aggressive ones who try to help themselves or continue to beg you for change after you told them no. In addition I've seen many people end up giving nearly all their hard earned money to panhandlers because they gave to one panhandler and other panhandlers approached them asking for them to give them change too. When the poor have nothing to eat, they will eat the Middle class. When the Middle class joins the poor, the poor will eat the rich. On that day all men and women will be equal and there will be blood everywhere. Honestly, I'm SICK of the homeless after having to deal with them day after day after day. I can't even walk a block without at least two or more homeless people harassing me. After a 50+ hour work week, I just want to sit quietly on the train, listen to music, and be left alone--not interrupted by someone asking for money or screaming and yelling or, worse, taking a dump on the train. I don't even acknowledge them in any way anymore because that would just further normalize them. We've lost having a minimum standard of social behavior in public places. It's sad that we can't even enjoy the public parks we all pay for because someone is living there in a tent or, worse, they've moved on and left all their crap and garbage behind. My sister laughs at me because her town doesn't tolerate the homeless AT ALL. The police keep them moving all the time and they get the message and leave and don't come back. San Francisco coddles the homeless and they've infested the entire city. You don't buy a new BMW without an address. A homed con man isn't the same as a homeless person. Why not read the pages you comment on? Homeless in my city make more money on the street corner in an hour than I do working two jobs all day and sometimes all week. I used to work retail and watched one of them drop a few grand cash like it was nothing and drove off in a brand new BMW. As an experiment I sat across from a bum one day and watched the number of cars that gave him money and bills he was given. In less than 4 hours the guy pocketed $860! Do not feel sorry for them. I offer jobs to them and have never even once had someone take me up on my offer. I am so sorry you're going through this; it's so wrong. I'm sorry I'm powerless to help you and I wish I weren't. You've paid a lot of money to that business for them to refuse you service. Few other businesses could get away with such a thing. You'll no doubt change your mind in a few years when you lose universal healthcare and even moderately wealthy people can become homeless due to ill heath. So many people here lose their insurance or top out their insurance from getting sick that people who used to be upper middle class die on the streets from illnesses like cancer or from having a child have an organ transplant. Unless you are more than a millionaire, you won't be safe from it yourself. While it would be poetic justice, like the Conservative Republicans who fight against healthcare access who end up homeless due to lack of healthcare access, I sincerely hope you don't have to learn basic human decency the hard way by being homeless yourself after your kid needs an organ transplant or your wife gets cancer. Im a homeless immigrant college student, there are teachers who are discriminatory against homeless students.. They scared me from taking my final today and are giving me an F. I've been their student for 2 years. Anyone who hates the homeless or thinks they are are all alcoholics/addicts should spend a night working in a dry shelter some day. Half the people there wound up there because of bad roommate situtions, bad relationships, unemployment. I think it would open a lot of eyes and hope many would realize "there but for the grace of God" and try to help not judge. I talk to homeless people from time to time, and find their stories a troubles interesting. The truth is, I've had this feeling that I am just an unlucky draw away from being in their place, and many of the issues they have resonate with mine. I found the story about the 2 daughters who wouldn't help their homeless Mother rather disturbing. I have 2 daughters , that age, they would never treat me like that. What kind of daughters are these? Why didn't they care? There is no excuse for that kind of narcissistic behavior. Troubles me. Thank you. I give money if I have any cash on me because the beggars who are actually homeless are in a very rough spot indeed and lack the necessary tools, skills, or possibly even the mental capacity to help themselves. It's worth it to me, even knowing that some percentage of them might just be running a con game. If I give even one person something he or she needs to survive or to feel less miserable, it's worth losing a few dollars here and there to people running a con. Hi Kylyssa, Congrats on HOTD! Very informative article, I often drop some doe in the can for the homeless but must be aware that all beggars are not really homeless. Some fake beggars make it bad for the real ones. No surprise that kids don't want to take in their parents. They don't want to give up their lives to help their own parent worried that the parent might take up a little of their time. They aren't even willing to help them find a place they can afford. 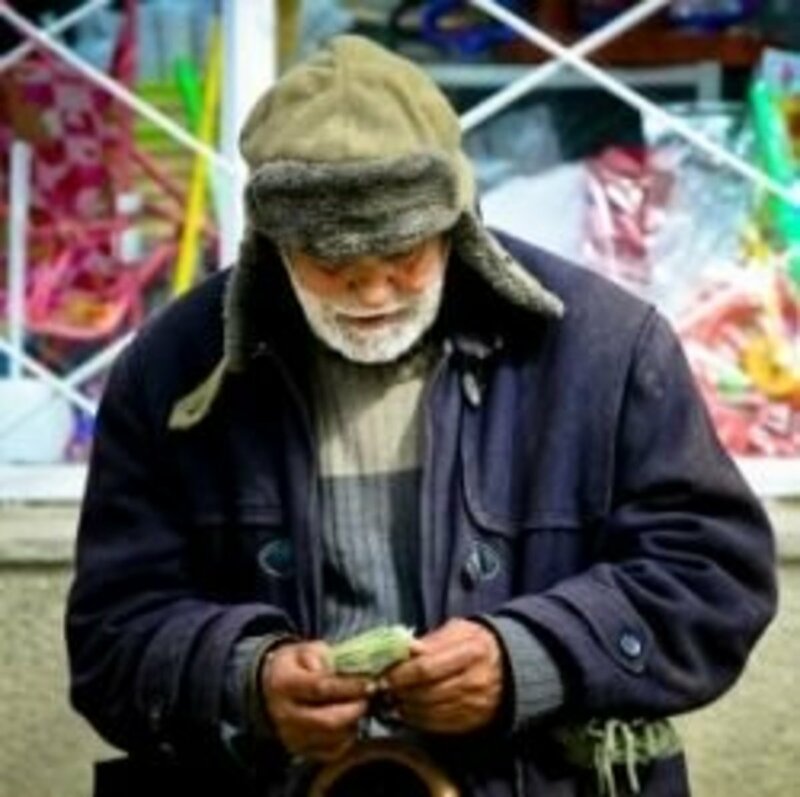 The sad part many that are living on the street could be helped if they are sick with the heart condition or diabetes or whatever they could go to a nursing home. At least there they would have a clean bed and three meals a day. The nursing homes would take almost all of their Social Security but at least, they would be safe. Department of Aging can help with that. Many Senior living places with little apartments charge very little rent. The rent is figured on what income they are receiving. There are also places for mentally ill. Their very own places. The problem is so many don't know how to go about finding what they need and have no help. We also need to get Veteran officers that know what they're doing. They turn many vets away that could get help. Kylyssa, what a poignant hub this is to get the coveted HOTD! This is well-written and moving about the homeless. It doesn't hurt to give them a hand in the soup kitchen or other places to help them out. Great job! This is the best choice for HOD I've seen in ages. What a great job you have done putting a face we can recognize to a situation most of us would like not to see. I know this hub is aged, but anyone who has seen "The Big Short" recently will empathized in a new way with anyone who is homeless. With probably good intentions to begin with, our government led many to absolutely unintended consequences that left thousands if not millions in this country financially ruined when all those people wanted was a home of their own. It could be any one of us. Fear makes us look the other way. Humanity should keep us from looking away. I actually envy them and often consider joining them. They got it all figured out that life is a Ponzi-scheme. I might just sell everything, put on a backpack and hid for the hills. Being retired I might check in with society once in a while. Then reality crashes in. It's a rough life and most of them are there for other reasons. If I lived on the street I would avoid most of them and it has nothing to do with hate. The only thing most interesting is why they are there to begin with. I am sure that there is a great social injustice at work. I live with these injustices each day and like a rat in a cage I have no choice until I put a gun to my head and pull the trigger. My suggestion on How to help mtaiilry Veteran Homelessness: PAY VETERANS THEIR BENEFITS PROMPTLY instead of putting them on a hampster wheel of denials. Veterans for Common Sense says it takes an average of 4.4 years for a Veteran to appeal his claim at the BVA (Blinded Veterans Association). Many Vets can not wait 4 years for their benefits and become homeless while on the long waiting list. The VARO's (Veterans Affairs Regional Office) keep making the same mistakes, over and over again, denying Veterans and never learning anything from the court cases that reverse the denials.The Veterans Benefit Manual published by Lexis Nexus demonstrates that there are 22 common errors made by the RO's requiring Veterans to appeal or forfeit their benefits. These common mistakes, repeated by the VARO's over and over again, result in Veteran homelessness en masse. 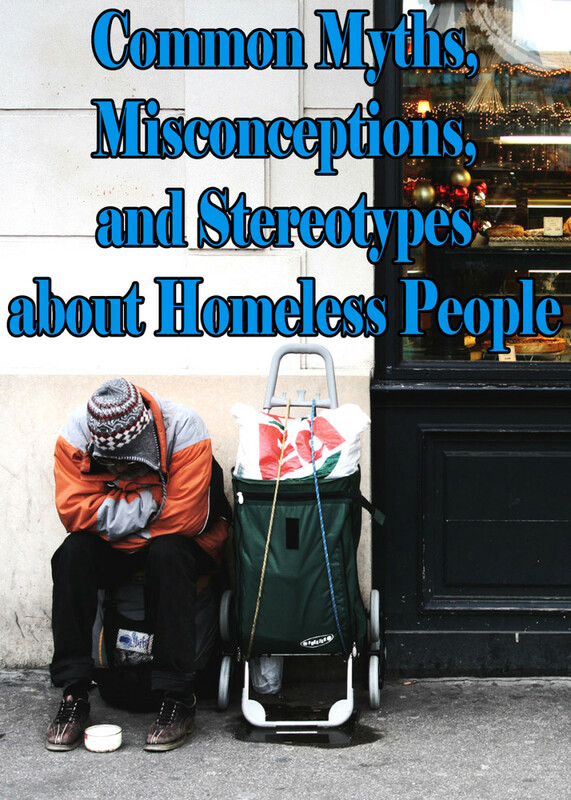 I agree, and people do stereotype and conflate panhandling with homelessness. I have a few friends who were homeless for about six months, and they never panhandled a day in their life. However, I do think the frequency of this depends on where you are. In my city, it's pretty common to be harassed for money by different people every single time you wait at a bus stop or step into a busy area. I also think that unfortunately people conflate the two when they're trying to advocate, and try to insist that it's harmless. When one complains about violent and aggressive panhandlers, the immediate response that one gets a lot of the time from people who purport to be homeless allies is "don't be so harsh, they're homeless, how would you feel to be in that situation?! Just give them some money or food..." When one tries to point out that not all panhandlers are homeless, they're attacked for being judgmental. There's no acknowledgment that homelessness and panhandling do not run together all the time, that a lot of these folks really do aggressively intimidate and harass people, that such behavior is unacceptable, and that nobody's obligated to give them money. Instead, some advocates act as though you must hate the homeless and be completely devoid of compassion if you refuse to give to panhandlers. I think the dialogue would be a lot more productive and that there would perhaps be more compassion for the homeless if there was an acknowledgement that aggressive panhandling is a very real problem that should not be encouraged or justified in any way. And it would help if more people took the time to point out what you have done- that being homeless and being a panhandler are two different things. Panhandlers are often homeless but only a small percentage of homeless people panhandle. 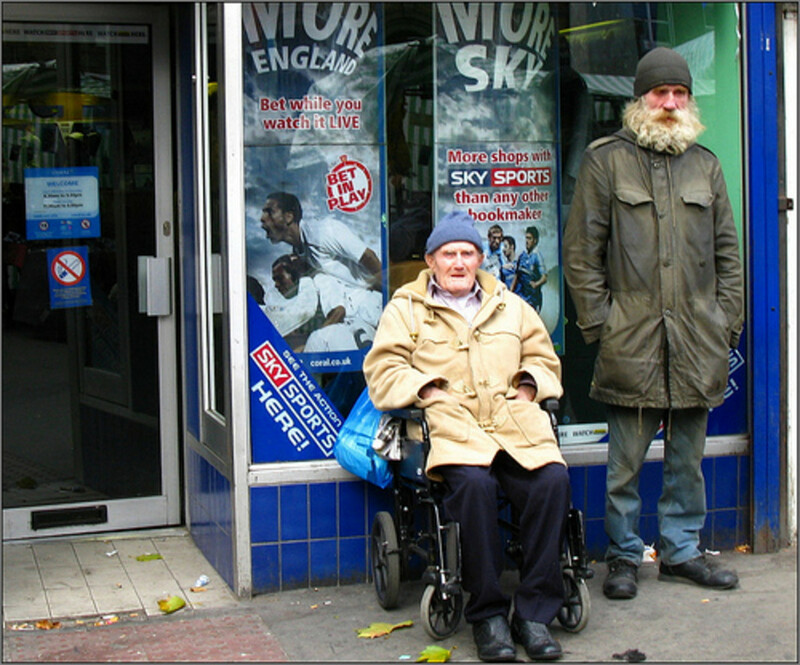 While you don't think of beggars as representative of all homeless people, many people do. They don't realize that the vast majority of homeless people don't panhandle and thus think they all do. The ones who do are plenty annoying but they don't represent the majority. A city with maybe fifty panhandlers generally has thousands of homeless residents. I've never seen more than six or seven in a single day in Grand Rapids yet our homeless population is in the thousands and contains a lot of families. I'm not afraid of homeless people and in the past I've volunteered at soup kitchens to try to help. And I'm not going to make any judgments on why someone is homeless. I live very close to the poverty line myself. However, I find myself becoming very resentful toward the large number of homeless in my city who aggressively panhandle. I've been menaced, harassed and intimidated by homeless people demanding money and cigarettes. I've been called ethnic slurs and have almost been physically attacked when I refused to give them any money. It's made me feel very unsafe and nobody should feel unsafe in their own community. These panhandlers seem to feel entitled to shake me down for money, and that angers me. And no, I don't give to them. For one thing, I prefer to donate to actual organizations that help the homeless and mentally ill. For another I have no desire to help someone who is violent or abusive, whether they are homed or homeless. I'm not a walking ATM. @anonymous: Gloria,I can empathize. I lost my job and ended up losing my apartment as well. I am well educated and wound up living in my car for two years, where I still reside. I was able to find a job and am pulling myself out of this. At my lowest ebb I also considered suicide. Not only does hopelessness take over, but lack of nutrition makes it more difficult to problem solve and help yourself.Having been homeless, I have absolute contempt for the homeless whereas before, in my wealthier days I would always give them money and help. I have met some homeless people who are genuinely down on their luck, educated people who met unfortunate circumstances and are trying to better themselves.....They will network and try to seek jobs or ask for assistance from new friendships they have established.But MOST I have met are mentally ill, sexual predators, conartists, drug dealers, or some combination thereof. Some are on fraudulent disability. One even tried to get me on disability. Even at my lowest ebb, I could never go on welfare. I always tried to better myself, even taking jobs like waitressing just to have money for food. The decent homeless don't beg. They genuinely look for jobs, go on welfare, or otherwise try to better themselves. I have been sickened to encounter abled bodied men demand money from me, even though they have more than I do. (I made a point not to look homeless.) They knock on your window and demand it. One homeless man I tried to help always ran around restaurants screaming, "help the homeless" before shoving his dirty hands in people's faces. At one point he said he hadn't eaten for a day, and so I walked with him around tables and asked if anyone could spare a dollar for him. He got enough for a decent meal. I have seen him come in with $50-$100 a day and then aggressively and loudly beg again the next day, only to proclaim he is broke. Where the money goes is anyone's guess. I can say that if I had $50, that could last me for a few weeks or more if I watched the money. But here I was homeless and looking for work and he was earning money like this harassing people. He even got enough money to spend the night in motels while I slept in the car. I finally cut him out after he pounced upon me again for money. I told him I was homeless too and he said he knew but he needed money. (I am supposed to give up the little I have for him?) He then demanded I give him a ride since he didn't feel like walking a few blocks. I declined this too and he cussed me out. I had tried to help him secure jobs but he preferred to beg. Another homeless man always slept at the library or McDonalds. In fact both places seem to be a magnet for these people. He cleaned his junk in the McDonald's sink and was just a vile, dirty man who lied about having a job and being prosperous and doing nothing all day but sleep. I would watch him jump over fences with the strength of a grizzly bear and yet do nothing all day. Many of these people are lazy, like being homeless, and/or make a lifestyle out of it. I'd say genuinely help those who are genuine. Avoid the panhandlers. Many of the pandhandlers are doing just fine...and consider this their job before returning to their home at the end of the day. They are lazy, greedy, manipulative conmen....Any time I have opened myself up to them or tried to help, I have run the risk of being robbed, abused, stalked, or raped. Just don'gt do it. These people are survivors. Some make hundreds of dollars a day, all tax free, shaking down people for cash.....Honestly, having seen and experienced homelessness, I have nothing but contempt for these people and ignore them whenever I can, with the exception of the rare decent person who deserves compassion and a little extra assistance to get back on their feet. @threefootsmurf: Thank you for everything you do. I'm fortunate in that I was so naïve and oblivious (and autistic) that drugs never even occurred to me when I was homeless. Lots of people offered but I always just said no thanks very casually, like someone who doesn't like peas passing them up at dinner, and no one ever pressed the issue. It wasn't virtue but more that I thought of drugs like smoking and smoking had no appeal that I could understand. I'm also glad that hooking never occurred to me. Both of those things are traps that can turn homelessness into a cage. Since then I've learned a lot and I've done what I can to help. The last few years more and more of what I've been able to do has been educating homed people about homeless people. I think it's almost fortunate my health has gone so I had to find a different way to help. As I get older, I have tended more and more to think the biggest obstacle and danger faced by Americans without homes is the ignorance-based fear of many homed people. If we could get rid of all the human-based dangers, homelessness would have very few dangers and wouldn't even be all that bad unless one were ill or disabled. I don't think I'll see that in my lifetime but we can all try to nibble away at that ignorance. I think you got this one dead on. its mostly imagined fears that have very little real relevancy. Many good people end up on the streets try the shelters and see the shady characters who use shelters constantly and end up in some wooded area because it is safer. then there are people who go out and choose to be homeless (like me) to help these people. 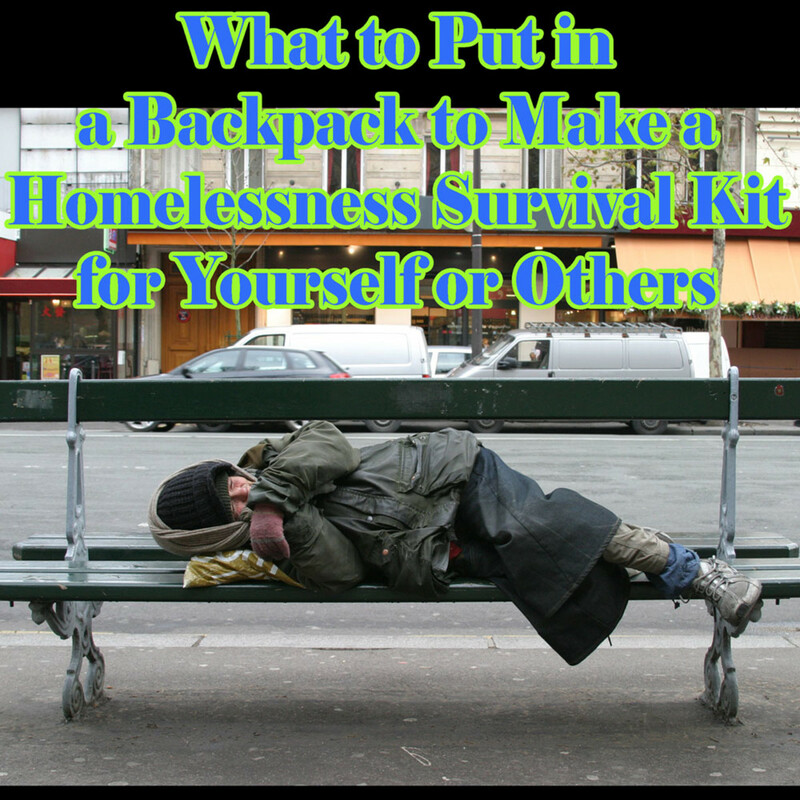 I have turned many lives around just from being at the right place at the right time with the right looks (another homeless traveler)and showing them that you don't need that stuff to be happy, all just by the way i live out there. Biggest success stories are, One kid who worked for a long time producing spice and was badly hooked on it, that lead to him losing everything and having to be on the streets. Just 3 days of me being around and since then he has turned around his life cleaned up and moved to another state.where he is doing good. the other one was a kid who was heavy into the party scene and living on the streets in Seattle, where its hard to get away from the drug culture (lots of meth heroin and crack everywhere). The kid mistook me for a dealer originally and after a bit when he found out i wasn't him me and this guy hung out for a few days, after that he split off to go back to his thing and got into a few issues. Because he had seen me living ok away from the drugs that surrounded me and that i was still happy. he decided to move away from there and started living like he saw from my example and has been doing very well getting his life back together. Sometimes all it takes is someone to show them (addicts) that there is a better way and that you can still be happy and live well on the streets without the addicting substances. @anonymous: Any time you are threatened by someone call the police. Calling the cops will at least get the criminal arrested. Cops pick up homeless people for doing nothing and beat the heck out of them, they'll surely arrest a homeless person who is actually harassing someone. Not doing anything but being afraid isn't a good policy. Police will respond and they will, at the very least arrest the person.I've been beaten, raped and robbed by homed people but I'm not terrified of all homed men and I wouldn't hesitate to call the cops if a person, homed or homeless, threatened me as you've been threatened. I don't hang around pandhandlers, either.Just because I've stated the majority of homeless people are regular people just like you, it doesn't mean that all homeless people have hearts of gold or that anyone thinks so. There are homeless murderers, rapists, and thieves just like there are people with homes who are murderers, rapists, and thieves. You know very well that the standard, American view of homeless people is that they are ALL, even the wee little babies and repeatedly raped women and teens, a bunch of worthless, criminal, drug addicts. Call the cops and they'll take anything you say about a homeless person as fact.Sending criminals to jail is a good idea. It's different, sending someone to jail for threatening someone than sending someone to jail for sleeping in public. @Kylyssa: Women and children weren't the ones following me to my car, soliciting money (which is illegal in my part of Texas), &amp; becoming irate when i truthfully told them i only carry a check card. All through college we knew that if we went to the drive through in fast food row (a street with 8 fast food joints on it near campus), we would be subjected to such treatment in the evenings. &amp; calling the police doesn't always help much, plus after reading this article about homeless with a heart of gold, i would think sending someone to jail wouldn't solve much. @anonymous: I fee the same way! I don't mean to make wrong assumptions like this article says but i have been followed, approached, &amp; solicited for money (which is illegal in this part of Texas), &amp; accosted for only having my check card - lots of people really don't have cash on them. I just don't want to be put down for being afraid of attack or robbery, or (as you mentioned) worse fates. I had a lot more empathy for the homeless until I met the violent ex cons and meth addicts. But, there are many good people who find themselves homeless. Unfortunately, we don't know the rules of the road. The ex cons and addicts are experts at it and most of it involves something illegal or manipulative. That's a lot of what you have to deal with in shelters, though! Those who do the right things and want to get ahead are labeled snitches. That's the worst atrocity in prison or addict lingo. Snitches get killed in prisons. I hate it!!! It's a world where to do the right thing is the wrong thing to do! It's all turned upside down. @anonymous: Call the police in any situation like this whether the man or men following or harassing you are homeless or not. You can report any person exhibiting criminal behavior.Most homeless people aren't going to sexually assault you because women and children make up over half of homeless people and women and children seldom sexually assault anyone. I was laid off and lost my apartment, my car was my home for the next year and half, shelters are dangerous for women on their own. Make no mistakes without a job, cell phone and car you won't get an apartment or rent a room. There is a hopelessness that takes over the mind and soul and I have considered suicide as an alternative. I am not a drug addict or alcoholic, I submit on average of 70 resumes per week and others will say the same, its not like it was a few years ago when jobs were everywhere and I have a college degree in Business. Don't judge because more than likely you will become one of us sooner than you think. In my community the people who hate the homeless the most are people on fraudulent military disability pensions who have secured employment with the federal government and people who have found wealthy patrons to live off of. These parasite seems to hate the hardest and hate the loudest. Most of us take the there for the grace of God go I attitude and do the best we can to assist those dealing with the unfortunate twists of fate that could descimate any of us at any time. Great article. Very informative. I'm weary of the homeless because I've been harassed by them before. I've been followed at night, threatened, and scared. I'm not saying every homeless person will act like this towards me, but some have. I'm just trying not to get sexually assaulted or raped outside my apartment. A person who is not kind enough to accept the poor and the homeless, is a cruel person. People in the states remain indifferent to the suffer of others - and that is a sign of cruelty. I think many fear the homeless people, because they aren't all done up like everybody else. Humans are naturally scared of people, who are different, but we shouldn't be! Congratulations on being listed on the 2010 Giant Squid Showcase! Another fabulous and insightful lens about the homeless. In our own community there are able-bodied young men begging for money (while smoking!) Our Neighborhood Watch group is also aware of several homeless people who sell drugs from their vehicles. Some of the people who supposedly live on the street refuse help from shelters, steal mail and newspapers from homes, and leave a mess behind. It's a big problem, and you've done an excellent job as an advocate for people who truly need and should receive help. Congratulations on your 2010 Giant Squid Showcase honor. You always say it better than most people with your own experiences and your gift of writing. Congratulations and wishing you all the best in 2011. I think you hit the nail on the head. People hate what they fear. And they fear the things that haunt them by being close enough to be a threat. There are few people who can say that they could never become homeless so I think it is a fear that many have. Congratulations on once again raising important issues and having this excellent lens featured in the 2010 Giant Squid Showcase. Congratulations on being on the 2010 Giant Squid Showcase Best of List! This is every bit excellent and from the heart. Congratulations on being one of the 45 on the Giant Squid 2010 Showcase. Very cool. :) This is an awesome lens. Congrats on making it into the Giant Squids 2010 showcase! Happy New Years! I think you're right and it's so sad! I don't know how anyone can actually hate another human being because they've had a difficult life. Great lens! As always, you have a beautiful way to explaining a touchy issue. I think that you hit the nail on the head. It is my PLEASURE to bless this lens! I think tv has created a stigma that most homeless people are panhandling drunks or drug addicts. Most of the homeless people I've known are just down on their luck. A very sensitive lens. Its easy to jump to conclusions and judge. There but for the grace of God go many of us.